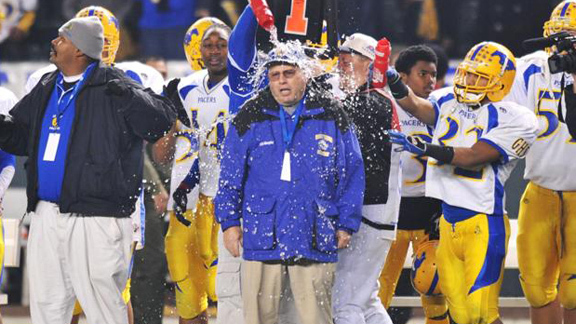 Perhaps the biggest win ever in Sacramento history was when coach Mike Alberghini’s team at Grant beat Long Beach Poly in the 2008 Open Division. Photo: Scott Kurtz. Pacers weren’t the Pacers when they started in 1932 and their first head coach was known for going in the wrong direction. Since the middle of the 1970s, however, Grant has been one of the most successful programs in the state and in 2008 produced the most historically significant win in CIF Sac-Joaquin Section history. Up next in this series: Capital Christian (Sacramento). The Cougars are becoming a small school powerhouse in Northern California. For more on the Cal-Hi Sports football archives project through the index card collection by legendary sports researcher Bruce McIntosh and how we can help your school, CLICK HERE. Note: One doesn’t have to be the football coach or AD to order this work. It can be presented to any school as a gift. For Grant’s archives, the work was requested and paid for by supporter Jay Triplett. Thanks, Jay, we’re sure the school will appreciate it — for many years to come. You could say that Grant High in Sacramento has some of the most passionate fans anywhere. We found that out first-hand at Cal-Hi Sports in 2008 when we picked the Pacers to lose in the CIF Open Division state final to Long Beach Poly. You’d have thought the prediction was a slap against the soul of the Del Paso Heights community. 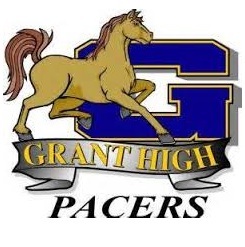 We were wrong – Grant beat the CIF Southern Section Pac-5 champions and finished unbeaten – but learned just how strong the connection is between the Pacers and the community they represent. 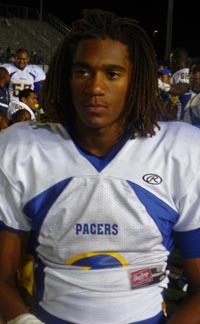 Shaq Thompson helped Grant beat Folsom in nationally televised early-season game in 2010. He’s currently playing for the Carolina Panthers. Photo: Paul Muyskens. That connection also was plain to see last season when the team, the school and the community was rocked by the shooting death of senior Jaulon “J.J.” Clauvo, who died after suffering a gunshot wound while going to lunch on game day. With head coach Mike Alberghini having to conduct some of the most painful interviews a coach ever has to make, Grant’s players and the school got through the tough days and finished a 10-2 season after a CIF Sac-Joaquin Section Division I playoff win over Beyer of Modesto and then a 24-21 playoff loss to Granite Bay. Granite Bay also was central to why the Pacers were considered an underdog to Long Beach Poly in that 2008 bowl game. Earlier in the playoffs, the Grizzlies nearly knocked off Grant but lost 22-19. Poly also entered as the CIF Southern Section Pac-5 Division champion (the top team overall in that section). Grant made the plays it had to down the stretch, however, and pulled off a 25-20 victory that certainly put Sacramento area prep football on the map. Since then, Granite Bay posted its own win over Long Beach Poly in a state bowl game and Folsom got one over Serra of Gardena. One player on Grant’s roster in 2008 was junior running back Devontae Booker, currently a rookie getting valuable carries for the Super Bowl champion Denver Broncos. With the 2008 season as anchor, the team’s record for the first decade of this century was 107-17-0, which came after a 100-19-2 total for the 1990s. Alberghini, a charter member of the CIF Sac-Joaquin Section Hall of Fame, was the coach of all of those teams except one. Much of the program’s success under him, however, also can be credited to his predecessor, Bob Vukajlovich, who guided the program from 1976 to 1990, helping the Pacers go 67-30-2 in the 1970s and 78-34-1 in the 1980s. While Grant was never that successful in earlier decades, the teams were rarely that bad. From the first season in 1932, in fact, the Pacers were only winless three times and two of those were the first two seasons. There also has been only two one-win seasons. With all of those factors, Grant’s reported all-time record (not counting forfeits) entering this season makes the state record book for both wins (561) and winning percentage (66.0). The only school in the SJS with more wins is Vallejo (which hasn’t been in the section all of the time), although we have never been able to figure out a win total for Sacramento High (which has reported scores from before 1905). In Grant’s first season in 1932, the head coach just for that one season was former Cal player Roy “Wrong Way” Reigels, who was an All-American for the Golden Bears in 1928 and is famous for scoring a touchdown running into the wrong end zone in the Rose Bowl. Grant also was winless in 1933 under a new coach and didn’t win its first game until 1934 against Preston Reform School of Ione. In the early years, the Pacers weren’t known as the Pacers. There are reports that teams instead were known as the Phantoms. In addition to its CIF Open Division state crown and its section title in 2008, Grant also has won SJS championships in 1992 (D1), 1999 (D1), 2003 (D1), 2006 (D2) and 2014 (D2). This year’s team fell to 6-2 last Friday after a loss to Sacramento Sheldon. If the Pacers make the section playoffs, it would be in Division I if they were to win the Delta League title, but that likely isn’t going to happen now so Division II would be it. *Note: On-the-field totals only. With forfeits and defaults counted, adjusted records would be 39-49-1 for 1940s and 101-19-2 for 1990s. All-time record also would adjust to 564-289-20. *Notes: Grass Valley and Nevada City were separate high schools until the early 1950s when they consolidated to become Nevada Union. Norte Del Rio was Grant’s natural rival, but the school closed after 1981-82 school year. Note: Grant also had 20-0-1 unbeaten streak in 1992-93. This included winning last nine in 1992 (first section title team), then next two, then a tie and then 11 wins in a row. *Note: After first seven reported games in school history (1932-1933), all losses, Grant played to a tie and would eventually have an 0-12-2 winless streak before first win in school history in 1934. I don’t believe Grant has ever played River Valley and certainly not last year. Not sure how they scored 56 against them in 2015. That was a typo from something else. 56 for Grant doesn’t even come close to being on its list. I only listed 70 or above. A lot in the 60s, too. Mark – wasn’t it Pleasant Valley of Chico, like in 96 or 97 that lost to Grant in something like a 64-56 game? 98′ Grant won 54-51 Onterrio Smith with 6 TDs. What a game! I was there. Smith is still the best HS football player I have ever seen. Agree, Onterio Smith was beyond his years in Highschool! Truly an unbelievable athlete! !